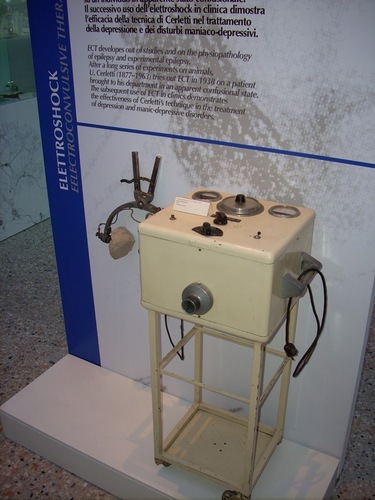 The first Electroshock (or ECT - Electroconvulsive Therapy) Apparatus used by italian psychiatrist Ugo Cerletti, with his assistant Lucio Bini, in 1938 can be seen at the second floor of the Museo di Storia della Medicina, inside the Istituto di Storia della Medicina (Viale dell'Università, 34/a) of the University "La Sapienza", Rome. 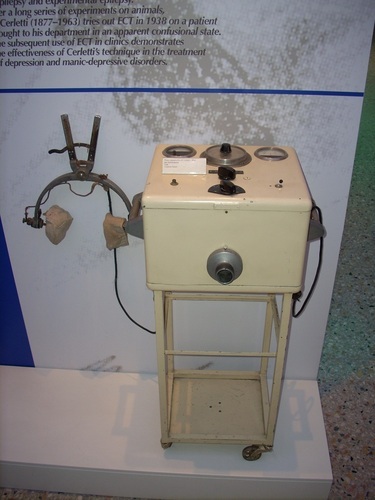 "After learning that electric shocks were used at the municipal slaughterhouse in Rome to obtund the pigs before disptching them, Cerletti and his assistants decided to proceed to clinical trials of 'electroshock' at the Clinic. The first patient was treated on 18 April 1938, a thirty-nine-year-old man from Milan, who was found wandering about the railway station in Rome hallucinating. After approximately eleven electroshock (ECT) treatments in one month, the patient was discharged in good condition and enthusiastic about his recovery, returning home to work - three months later his wife complained that his symptoms were recurring"1. - A.Aruta, Shocking waves al Museo: l'apparecchio per l'elettroshock di Bini -Cerletti, Medicina nei Secoli, 22/1-3 (2010), pp.11-24. - E.Shorter and D.Healy, Shock therapy. A History of Electroconvulsive Treatment in Mental Illness, Rutgers University Press, New Brunswick 2007. 1. W.F.Bynum and Helen Bynum, Dictionary of medical biography, Greenwood Press, Westport (CT) 2007, vol. 2, p. 315.